If you're not 100% satisfied with your purchase: let us know and we'll give you a 100% refund! The Animals at Risk from Climate Change Poster features 25 animals that highlight the fundamental impacts of greenhouse gases—causes, effects and risk of extinction—on all forms of life on the planet. Through illustrations, symbols and brief explanatory text, the complex interaction of biological traits and environmental conditions that cause a species to be susceptible to climate change are made simple and understandable. Comprehensive and thoroughly documented, this poster is a valuable and relevant educational aid. 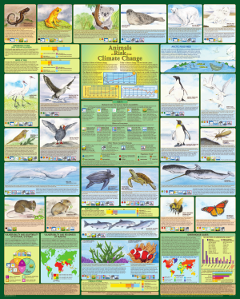 The eyecatching and information packed 24" x 30" poster is available in folded, flat, and laminated formats, all printed in the USA on FSC certified recycled paper. 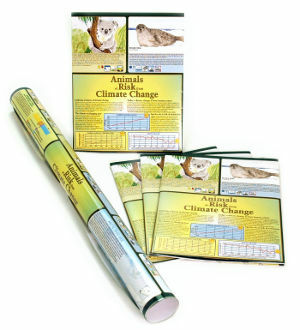 The 75 page downloadable presentation includes all illustrations, keys, text and charts from "Animals at Risk from Climate Change"—a unique and timely companion to the wall poster. The flexible hi-resolution PDF platform functions both as a carefully sequenced slide show and a set of printable handouts. The digital Presentation is a useful tool for classroom or public demonstrations; the synergy that comes from many people coming together and reaching a collective awareness has power and can be the start of awareness and change. For quantities over 9, please contact Melanie at mm@theglobaleducationproject.org or phone 206 261 1453. * Occasionally our exuberant on line calculator overcharges for shipping or does not give the discount for orders of ten or more. If this occurs, you will promptly receive a refund for any excess charges. To accommodate our international trade all prices are in US Dollars. Credit card orders are processed by Sunship Distributors.